Our own; Miss Africa beauty Quiin Abenakyo is a fresh graduate from Makerere University. Her recently acquired Bachelor’s degree in Business Computing has attracted attention not because the beauty queen is shining in global platforms without the aid of this degree but the degree’s legitimacy itself. The legitimacy of this degree will not have been challenged, had a one Mr Musiri not come into the picture. The story took a twist when Mr Musiri petitioned the Criminal Investigations Department (CID), the Academic Registrar of Makerere and the National Council for Higher Education to probe the connivance of the Vice Chancellor, Prof Barnabas Nawangwe in allegedly giving a female student academic favorus. We must explore the facts first. 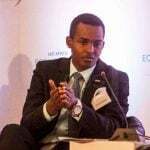 Quiin Abenakyo did not complete all the legal requirements for the award of a Bachelor’s degree in Business Computing. This also means she was not supposed to graduate. 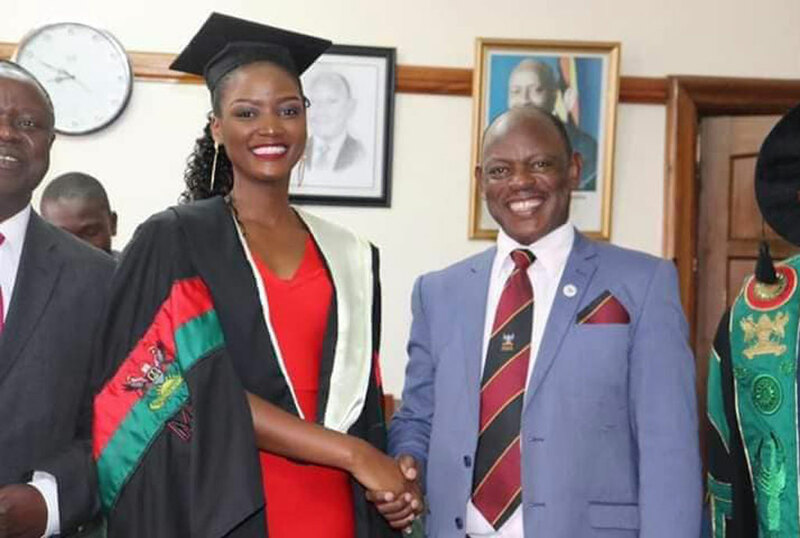 Quiin Abenakyo without appearing on the graduation booklet; was allowed to sneak into the university on 18th January 2019 during the 69th Graduation at Makerere University with her gown, to graduate. This was even approved with a blessing from Vice Chancellor, Prof Barnabas Nawangwe. The handshake between the two inside the Nawangwe’s office said it all. When Vice Chancellor Prof. Barnabas Nawangwe was appointed at the helm of Makerere University, he banned addendum lists. This implies that the only way Abenakyo could have graduated is if the graduation booklet was edited last minute and proof read by the registrar but this is no longer an option any more. Abenakyo should have graduated next year. Later this week, more details were revealed when the Principal of Makerere University Business School confessed that Quinn Abenakyo did not qualify for a degree because she had failed her Financial Management paper, because she did not have time to retake it since she was running for Miss Uganda. Quinn Abenankyo should not have graduated, but her graduation clearly shows that the university leaders violated the institution’s rules making Abenakyo a victim of their own mistakes. The University is given the powers to award an honorary degree to any person who has excelled in any sector of life. 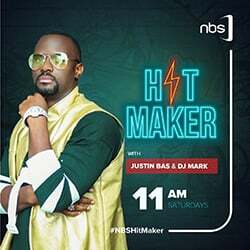 Does Abenakyo qualify for one? Let us look at the Makerere University Honorary degree guidelines. In accordance with the provisions of Section 47 of the University and other Tertiary Institutions Act 2001. The University may consider conferring an Honorary or Title upon any person who has excelled in any sector of life as it may deem fit on the recommendation of an Honorary Degrees Committee established jointly by the Senate and the University Council. Proposal to grant Honorary Degree or any other award may be made by a member of the University Community and shall be communicated in writing to the Vice-Chancellor. Every such proposal shall be accompanied by detailed curriculum vitae, a statement setting forth the award recommended and the detailed grounds on which the recommendation is based. No proposal will be received without these details. Let us dig deeper. The Honorary Degree Awards shall be Doctor of Science for academic contribution in the field of Science, Doctor of Letters for academic contribution in the Humanities and Doctor of Laws for Public Service by eminent statesmen, administrators and lawyers. The Degrees of Master and Doctor of Philosophy shall not be awarded Honoris Causa. So does Abenakyo qualify for any degree be it an honorary one? Makerere University has over the years threatened to recall degrees but this has never been successful. Case in point is in 2017, where the institution threatened to recall 69 degrees, an investigation was conducted but the recall did not happen. In the case of Mukasa Mbidde and Mike Mabikke .v. Law Development Center which was appealed up to the Supreme Court. The position of Justice V.T. Zehurikize which was held by both Court of Appeal and Supreme Court allows Academic Institutions to at any time review any academic awards previously awarded by an Institution through an investigative process like the ad hoc examinations, irregularities and malpractices committee of Makerere University. However for Makerere in particular the decision to recall or cancel degrees seems to be a preserve of the University Senate pursuant to Section 45 of the Universities and Other Tertiary Institutions Act. Having stated for you all facts indicating that Abenakyo did not qualify for this degree, and given the University’s history in failing to recall degrees, will the institution expedite this process and report to senate? Prof. Balunywa’s literature exposes the incompetence inside Makerere University. Not just that; wait for it; This tweet from Prof Nawangwe saying ‘Quinn graduated legally after completing all requirements, the record is available’ even confirms the incompetence Prof Balunywa pointed out. Ladies and Gentlemen; Did Quinn Abenakyo legally graduate after completing University requirements? Your verdict is as good as mine.